One of the perks of maintaining pet chickens is their ability to help clean up scraps and leftover foodstuffs. But you must keep some edibles well away from your chickens' beaks, for their benefit and your own. Knowing which ones to avoid is the start of keeping your yard birds out of danger. Chickens are by nature foraging creatures, generally naturally capable of avoiding dangerous or toxic plants in their yards. But it’s better to avoid certain dangerous plant species to begin with rather than risk a dead chicken. Dozens of commonly grown plants can be deadly if ingested in large-enough quantities, and dozens more can cause sores, irritation or intestinal damage. Chickens rarely eat bitter-tasting weeds and flowers in amounts that can cause problems, but common species to clear from your yard are potato sprouts, rhubarb, meadow buttercup, ragwort, clovers, most ivy species, and most houseplants and flowers that are considered toxic to animals, such as irises, daffodils, azaleas, nightshade and oleander. Blue-green algae is also very dangerous, so keep your chickens from stagnant water where the algae may grow. Avocado skins and pits, uncooked beans, citrus and raw potato peels contain substances that can be toxic to chickens. Chocolate is also harmful. Avoid particularly sugary and sweet foods. Pet chickens are voracious foragers and will happily help clean up your table scraps, but anything you offer your chicken should be in relatively good condition -- do not offer moldy or spoiled foods, or large amounts of raw meats. Avoid feeding eggs, because some chickens may begin raiding their own coop once they develop a taste for them. Keep any area your chickens have access to clear of small, inorganic debris the chickens could mistake for food. A hungry hen could easily ingest bits of plastic, rubber and metal, proving fatal under the wrong circumstances. 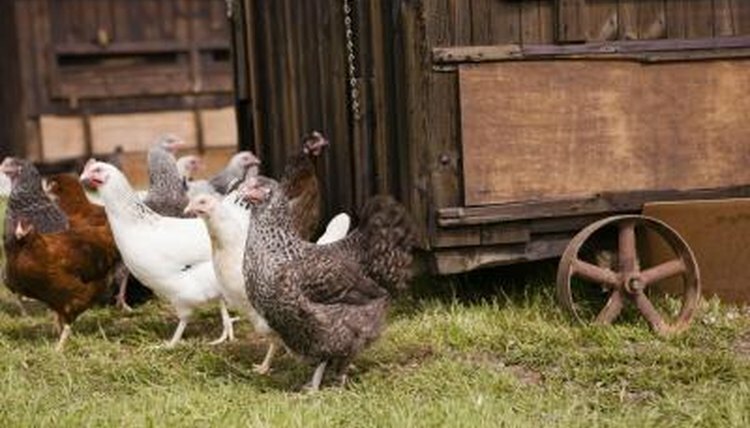 Also avoid using insecticides or herbicides near the chicken coop to prevent your chicken from eating bugs or plants that have been in contact with these substances. Avoid feeding your chickens highly odiferous food products, such as members of the onion and garlic family, if you are keeping chickens for egg-laying purposes. The same chemicals that give these plants their characteristic scent can wind up in the eggs your chickens produce, causing them to potentially smell -- and taste -- a little more seasoned than most palettes would prefer.